Besides being Halloween tomorrow, it's also the very last farmers' market of the season. We grabbed some last items a week ago since we wouldn't be able to attend. It always makes me sad to see another season go, but it makes waiting all the more worthwhile. 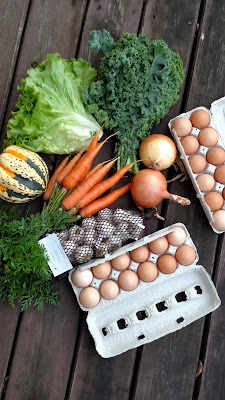 For now, I have a decent supply of seasonal produce to stretch into the cold, winter months. I am no expert in this area, but I've had some questions and inquiries to share on how we made our own little makeshift root cellar. When setting up a cold storage, your first concern is finding the darkest and coolest spot in your home or basement. Typical temperatures should be between 34-50 degrees. This will help to slow down the chemical process that ages your food. I don't recommend the garage, just because it can get quite cold, especially if you live in the Midwest like I do. I've left a box of apples there before, and while they do last into December and maybe January. By the time those frigid temps come, those apples will freeze and turn to mush. We are using a spot in our basement, but another possibility could be a closet in your home that stays fairly cool. You certainly do not need any fancy gadgets to store your produce for winter. I am a fan of making do with what you already have on hand. My husband's grandfather had made these awesome wooden crates before and we actually thought about purchasing materials to make more of our own. Instead, the hubby had the great idea to re purpose an old daycare shelf we were not currently using. It's working great so far! 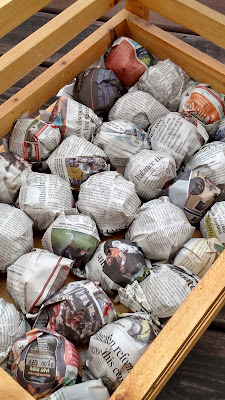 Maybe you have some old plastic type crates laying around? Baskets, any old storage unit not in use or heck, even boxes can work. Squash is a great and easy option for long term storage. If all goes well, there is no reason why it couldn't last at least until spring. They've got a hard, protective skin that will last. I've got butternut, acorn, spaghetti and sweet potato squash in my cold storage shelf. Butternut will last the longest of these varieties. Pumpkins will keep for a few months, definitely in time for those holiday pies. Read here for how to roast a pumpkin and preserve the puree in your freezer. I had a co worker grab me fifty pounds of potatoes when she traveled to Wisconsin one weekend. The cost was $8 and I just couldn't pass that up. We're honestly not big potato eaters but I have a couple ideas in the event we need to use them up quicker than anticipated. The hubby got a little antsy and dumped the whole bag into my shelving unit. It's better to leave them in their bag for longer storage, so we'll see how these turn out. My husband's grandmother said to put an apple in there to help them last longer. I don't know of any truth to that myth. Any ideas?? Apples are great to have through those cold months but can be a little tricky when it comes to preserving. They can bruise easily and then causing others in the box to rot quicker. That's why this year we're storing ours a little differently. I recently read about wrapping each individual apple in newspaper to protect them a bit more. That way if and when one becomes bruised, it's not as likely to affect the others in the bunch. I took some time yesterday morning preparing our stash for the winter. Small to medium size are best for keeping for long term, they just seem to last longer. Start with tearing newspaper into small sections. 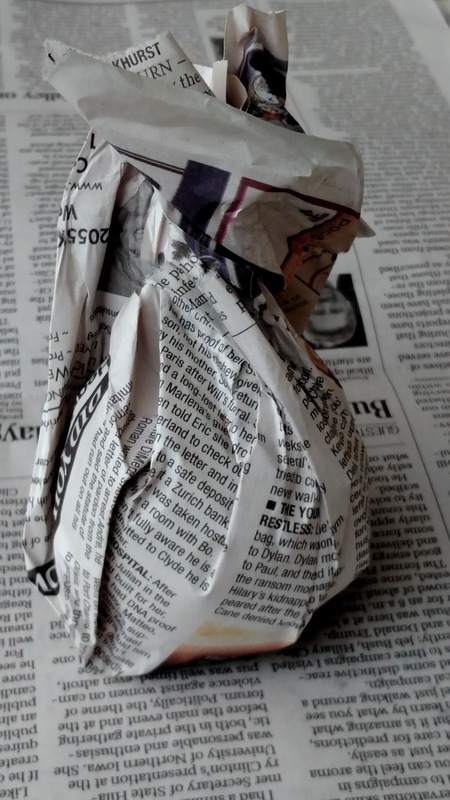 You'll then want to wrap each apple in the newspaper, Gather all ends and pull up and sort of twist the newspaper together at the top. Be careful not to twist too hard though, otherwise you'll tear the paper. Then lay each apple into a cardboard box or crate like we're using. They're then ready to be stored in your chosen cool spot. Take note to not store apples right by other produce, especially potatoes. 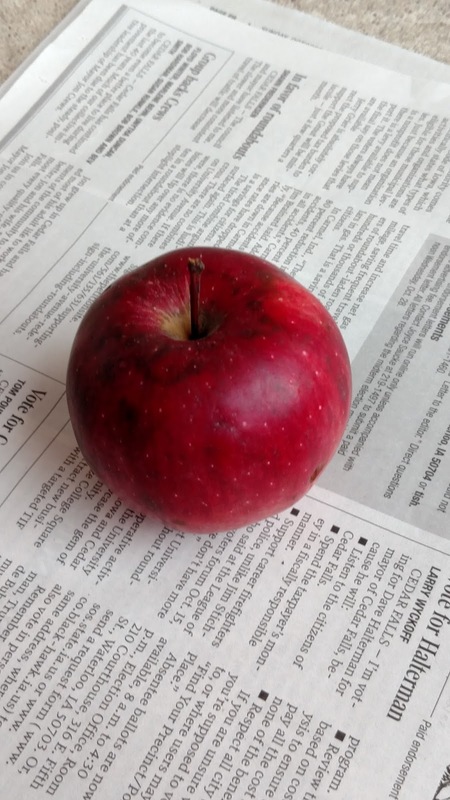 Apples release a gas that can spoil other food at a faster rate. I've always had good luck with garlic and onions lasting for long periods of time. We would always receive an ample amount of garlic in our CSA boxes and I loved being able to carry that over into the winter months. I scored a nice mesh bag of it last week at the market, so I'm looking forward to using fresh, local garlic all winter long. I know garlic can last longer stored in some sort of mesh bag like this, but honestly I've even left it on our counter for long periods and it's done just fine too. These just happen to be the items we focus on storing in our house. I have read that carrots and even cabbage are other great items to long term storage, if done properly. But I have no experience in that area. Maybe someday. However, if those are items that you've been successful in, feel free to let us know in the comments. I'd love to hear any suggestions! Again, I am no expert and these are just ways that are working for our family right now. Feel free to use any of the ideas I've shared, but also ask around your area. See what is working best for your climate.